The science of coffee making is actually pretty simple. You have 4 main variables: surface area which is controlled by how fine the grind is, water temperature, and time the water is in contact with the ground coffee, and coffee to water ratio. 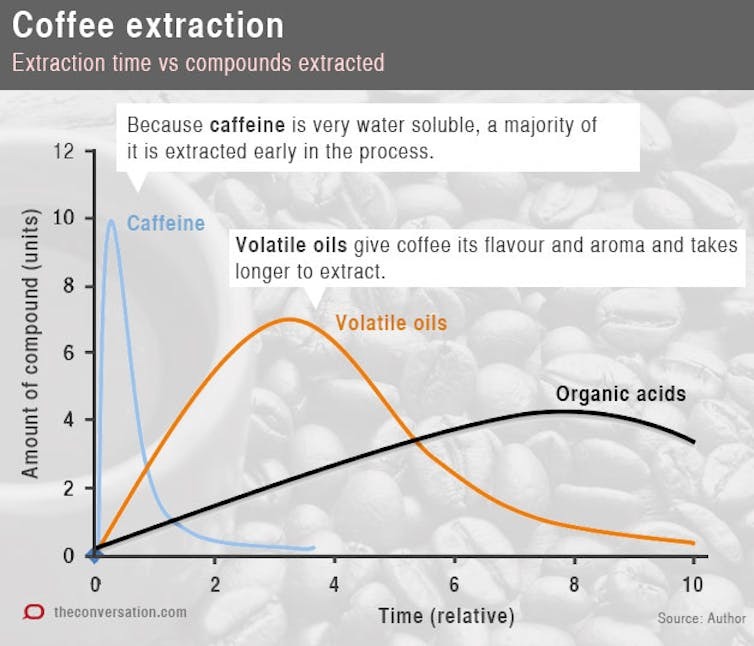 This diagram shows nicely the time vs extraction of various components of the coffee bean. Basically you want to extract the nice tasty oils without extracting the nasty, sour acids (often what people call “burnt coffee” but is actually overextraction). The problem I had with the moka pot was I was using too fine a grind and so it was being overextracted. People love a shortcut and the espresso capsule/pod is the marketing genius shortcut that has entered into most consumers homes. What companies like nespresso are essentially doing is selling you old stale coffee in a pod. See a coffee bean is like an uncut apple. It’s fairly resistant to oxidation and all the tasty oils are locked up inside. Once you grind that bean it starts to oxidise in seconds, much like a cut apple turning brown. That’s why pre-ground coffee comes vacuum packed. But as soon as you open that pack and let air in, it becomes stale very quickly. To make good coffee, you must start with a whole bean and grind it just before brewing. There is no way around it. The grinder is the single most important piece of equipment for the home barista. You can brew fantastic coffee with a cloth filter over a cup but if your grinder or rubbish, you will always have bad coffee. I often see people buy a coffee machine for hundreds to thousands of dollars, and then get a whiz-blade spice/coffee grinder for 50 bucks. The problem with a blade is that it smashes the bean into particles of non-uniform sizes. So as the water travels through the ground beans, the small particles are extracted more than the big particles. To get uniform particles you need a conical Burr grinder. The conical burrs grind the beans until the particles are able to fall through the gap between the burrs. This results in particles that are all very similar in size. This means that as the water moves through the ground beans, there will be uniform extraction. You will be looking at about $150 or more for a conical burr grinder that is motorised. The cheapest option is a conical hand grinder where the motor is your muscles. I have a porlex which I use for work and if my baby is sleeping and I need to be a stealth ninja. If espresso is your thing and you don’t want to fork out hundreds of dollars for a decent coffee machine, then a moka pot is probably your best bet. The concept behind espresso is that the extraction happens under pressure and this forces more of the coffee oils out of the ground beans. You generally use a finer grind and the contact time with water is less. For my money, the cheapest setup as a starting home barista was an aeropress. This is basically like a giant syringe that you put ground coffee and hot water into, then you plunger it through a filter into your mug (your ceramic mug, not your face). The resulting brew is more dilute than an espresso and more concentrated than drip coffee. There are lots of tutorials online, included the inverted method which is what most aeropress users go with. If you are interested there is a wealth of information on coffeegeek. Life is too short to drink crap coffee!